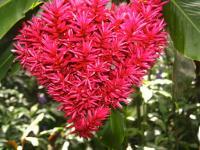 Welcome to the ultimate in Big Island luxury vacation rentals and information about luxury vacations in the Islands. Hawaiian Beach Rentals has assembled this collection of Big Island luxury home rentals based on exquisite locations, extravagant amenities, and beautiful natural surroundings. Our Big Island luxury home rentals include a variety of amenities from private hot tubs, spas and saunas to the unique architecture and lush landscaping. No detail is too small in the design of these luxury homes and the planning of your luxury Big Island vacation. Below is information about everything you need for a relaxing and enjoyable visit to the Big Island including private jet service, top restaurants, personal chefs, luxury car rentals, the best adventures, beaches and natural attractions, private yacht charters, helicopter tours and high-end shopping. Also noted are some of the Big Island's famous residents and visitors as well as annual Big Island events where you can experience authentic Hawaiian culture, entertainment and food as well as an abundance of the "aloha spirit" in the kindness of the Big Island's residents. Luxury private flights to the Big Island are available through numerous companies with exclusive and first-class service. ElJet offers private jet service to the Big Island of Hawaii's two major airports in Hilo and Kona. They offer a selection of aircraft and itineraries, and accommodate special requests, with access to a large network of private jets and FAA Part 135 approved operators with discounted empty leg flights ideal for one-way travelers. Also offering Big Island jet charter service is Monarch Air Group which flies to Hilo, Kona and also the Waimea-Kohala Airport. Paramount Business Jets also provides private jet service to and from the Big Island with a choice of aircraft including the popular Gulfstream IIB and Challenger 604 as well as economical turboprops. They also offer discounted empty leg flights. The Big Island is home to many five-star chefs who create innovative and delicious cuisine at various locations around the island. Huggo's is located beachfront in historic Kona town and is a great place to watch the sunset and enjoy top-quality Ahi Tuna Poke. Pahuia is an award-winning restaurant at the Four Season Hualalai right next to the ocean, and is another great place to enjoy the sunset. Try their Keahole lobster curry or Hawaiian sea bass. Beach Tree is also at the Four Seasons Hualalai and serves up amazing lasagna as well as fresh fish. Also known for its fresh fish is Roy's which offers up Hawaiian Fusion cuisine and exceptional desserts including a notable chocolate souffl. Enjoy the sunset lighting of the tiki torches at Kamuela Provision Company at Hilton Waikoloa Village. At the Fairmont Orchid is the AAA Four Diamond Brown's Beach House Restaurant. They are known for their grilled Ono and Mahi Mahi as well as live music. The Manta & Pavilion Wine Bar at the Mauna Kea Beach Hotel provides a lovely oceanside setting and you can watch manta rays swimming beneath lights in the water. Merriman's in Waimea serves up gourmet meals designed by its award-winning chef Peter Merriman. Norio's Japanese Restaurant and Sushi Bar is located at the luxurious Fairmont Orchid with great sunset views. They serve up the finest sushi rolls, lobster and shrimp tempura, and mouth watering main courses like misoyaki butterfish. Sit at the sushi bar or enjoy dining in a private room with a garden view. The Big Island has many superb chefs who will cater to your every culinary need including finding the finest local produce and seafood, and then arranging whatever food service you desire including romantic sunset dinners, breakfast on the beach, meals cooked in your accommodation or delivered to you ready to eat. Outrageous Gourmet offers personal chef and catering services on the Big Island, cooking up gourmet cuisine for the dining experience you choose. They will also help you plan events and weddings as well as family dinners and they also offer interactive cooking lessons. Private Chef Kathy Morris specializes in in-home catering utilizing local produce, meats and fish. Special requests are accommodated including vegan and gluten-free meals. She is also known for her exotic tropical cocktails. Smart Chef Hawaii provides personal chef services based on the west side of the Big Island offering special occasion meals as well as regular meal services and personalized menus. Cater Hawaii features the gourmet cooking of Chef Amy Ferguson who utilizes the freshest Big Island harvests for comfort food as well as gourmet food. Dietary requirements and personal tastes are accommodated. Tour the Big Island in style with an upscale car rental. Kona Exotic Car Rental offers the Ferrari Testarossa and Lamborghini Gallardo as well as Mercedes, BMWs, and Cadillacs. They also have Porsche cars and Hummers. Harper Car and Truck Rental offers specialty vehicle rentals including passenger vans and also four-wheel-drive trucks. They operate out of both Hilo and Kona, and unlike most rental companies they allow their 4-wheel-drive vehicles to be driven to the summit of Mauna Kea Volcano at elevation 13,976 feet where 4-wheel-drive is required. You will also need a 4-wheel-drive if you want to drive down into Waipio Valley. The Big Island is a place of adventure and scenic beauty from the white sand and black sand beaches to the breathtaking landscapes of an active volcano. The Kona Coast is a world-class deep sea fishing area where you can go after prized game fish like marlin and swordfish. Enjoy a snorkeling and dolphin watching tour and during the winter months whale watching excursions will bring you close to giant humpback whales breaching from the sea. This coast is also ideal for sunset sailing and dinner excursions. The Big Island has world championship golf courses at posh resort areas like the Kona Coast and Kohala Coast with beautiful beaches and fun snorkeling and other water sports. The scenic Hapuna Beach on the Kohala Coast is the Big Island's largest white-sand beach and has picnic facilities and shaded areas making it a nice place to spend the day. Tour the Big Island's famed Kona Coffee Country to meet the farmers of the prized beans and sample their wares. Go horseback riding in the rolling ranch lands of Waimea or drive up to the top of Mauna Kea to see world-famous astronomical observatories. 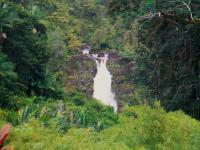 Above Hilo town you can visit the thundering Rainbow Falls, then drive along the Hamakua Coast to see the towering Akaka Falls and the steep-walled Waipio Valley, visiting botanical gardens along the route. In Hawaii Volcanoes National Park follow the 11-mile-long Crater Rim Drive to see the stunning landscapes of the summit caldera and craters, stopping at lookout points and enjoying short hikes as well as a visit to Thurston Lava Tube. Stop in at Jaggar Museum which is set near the rim of Halemaumau Crater with awe-inspiring views, and nearby is the informative Kilauea Visitor Center as well as the historic Volcano House. View this amazing area as well as the rest of the Big Island from above on a helicopter tour which can fly above many areas inaccessible by road, including the most active volcanic areas where lava flows into the sea. Chartering your own private sailboat, sailing catamaran or motorized yacht is a great way to enjoy the Big Island's beautiful coastline. Maile Charters offers private sailboat charters on a renovated and restored 50-ft. GulfStar sloop. Half-day or full-day excursions include snorkeling and seasonal humpback whale watching on the Kona Coast or longer voyages between the Islands. Enjoy a sunset appetizer cruise. Hawaii Sailing Adventures offers private charters on luxury catamaran sailboats including snorkeling excursions, dinner cruises and visits to remote beaches. Work the sails if you wish, or just relax and enjoy the views. Mauna Lani Sea Adventures also offers private bIg Island sailing charters. The "Winona" accommodates intimate gatherings as well as larger groups and has a full galley and private master cabin with shower and private bathroom. There is a covered cabin area and large viewing windows as well as a spacious open deck and two restrooms. A "Stairway to the Sea" provides easy access to the ocean for swimming and snorkeling. They also offer professional video services if you would like a keepsake of your voyage. A Big Island helicopter tour is a great way to see the island from a birds-eye view. Blue Hawaiian Helicopters flies out of both Hilo and Waikoloa offering tours of the Big Island including Volcanoes National Park. Flying Eco-Stars and customized A-Star helicopters, Blue Hawaiian offers amenities including Bose noise-canceling headsets, 4-camera digital DVD in-flight recording and two-way communication with the pilot who is also a certified Hawaii tour guide. Safari helicopters focuses on luxury and provides air-conditioned comfort, Bose X noise-canceling headsets, two-way communication with pilot and oversized windows as well as their signature "Safari skylight." They fly the advanced A-Star 350 B2-7 helicopter with a 4-camera video system to record your flight from all angles on 45 or 55 minute tours. Paradise Helicopters offers customized Big Island helicopter tours allowing you to personalize your adventure from volcanoes to white sand beaches and also offers exclusive landing access for ziplining, hiking, or a gourmet picnic overlooking a waterfall. Great shopping can be found on all sides of the Big Island from the posh resort areas of the Kona and Kohala Coasts to Hilo town and even in Volcano National Park. On the Kohala Coast check out the Kings Shops with more than 35 stores and eateries as well as live hula and other entertainment. The shopping center also has a Tiffany's, Coach, Louis Vuitton and other high-end shops including apparel and fine jewelry. In Hilo town there is a Macy's and nice gift and clothing shops at Prince Kuhio Plaza which is the Big Island's largest enclosed shopping center. Atop Kilauea Volcano in the Volcano House Hotel is the Volcano Art Center showcasing a variety of custom local art including paintings, wood sculptures and Polynesian crafts. 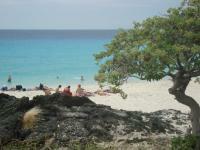 On Alii Drive in Kona you will find some nice shops as well as art galleries and restaurants with ocean views. The Big Island of Hawaii has long been a favorite getaway for celebrities, sports stars and the super wealthy. They come for the perfect weather, peaceful ambiance, fabulous beaches and beautiful scenery. Roseanne Barr bought a macadamia farm on the Big Island and filmed her reality show "Roseanne's Nuts" there. Michael Dell, who is CEO and the founder of Dell, Inc., has a $61 million beachfront estate in Kona. Charles Schwab also calls the Big Island home, as does Microsoft co-founder Paul Allen who also owns the Portland Trailblazers and Seattle Seahawks. Those who love to vacation on the Big Island is long and includes such notables as astronaut Buzz Aldrin as well as Harrison Ford enjoyed his 65th birthday on the Hamakua Coast along with Cate Blanchett, John Hurt and Steven Spielberg. The Big Island of Hawaii has a diversity of annual events and festivals offering a memorable glimpse into the history, people and culture. From town celebrations to film and music festivals, hula dancing and traditional cultural events, there are many opportunities to enrich your Hawaii vacation. The Waimea Town Celebration is held over two days in February including sporting events and cultural demonstrations. Also in February is the Waimea Cherry Blossom Festival including Taiko drumming, dancing, processions and lovely cherry blossoms! Taste local Hawaiian beer at the Kona Brewers Festival in March including music and fire dancing. Also in March is the Kona Stampede & Rodeo in Honaunau, as well as Tahiti Fete featuring Polynesian dancers. The Merrie Monarch Festival in March/April in Hilo is the world's premier hula competition. The Big Island Film Festival is held in May, as is the Kau Coffee Festival. The King Kamehameha Day Festival takes place in June, as does the Puuhonua o Honaunau Annual Cultural Festival featuring cultural demonstrations. In July is the Big Island Music Festival as well as the World Billfish Challenge centering around Kailua Pier over a two week period. Also in July is the Parker Ranch Fourth of July Rodeo including horse racing and roping. October is time for the Ironman World Championship starting in Historic Kailua Village. Also in October is Mealani's Taste of the Hawaiian Range featuring Hawaii's best chefs serving up a diversity of culinary creations featuring Big Island beef and produce. The Kohala Country Fair takes place in Hawi in October and features food, dancing and live music. The Kona Coffee Cultural Festival is held in November with various events held throughout the Kona region. Hawaiian Beach Rentals offers luxurious places to stay in all of the Big Island's most desirable areas for a vacation you will remember the rest of your life. Our goal is to make sure you have a perfect vacation by assisting you in your selection of an outstanding luxury Big Island vacation home that meets and exceeds all your needs and desires. Please browse through our listings to get an understanding of the many different amenities and property features that are available. We take pride in offering the largest selection of high-quality luxury rental properties on the Big Island and list only the best of the best properties on our site. If you have any questions about luxury vacation rentals on the Big Island or which area is best suited for you, please give us a call and we will be happy to assist you. For more information about Big Island shopping, dining, beaches and activities please see the Big Island Vacation Rentals page as well as our feature pages on Beaches, Things To Do, Golf Course and Hikes. If you need any help or recommendations when planning the Big Island luxury vacation of your dreams, please feel free to give us a call and we will be happy to assist you any way we can.